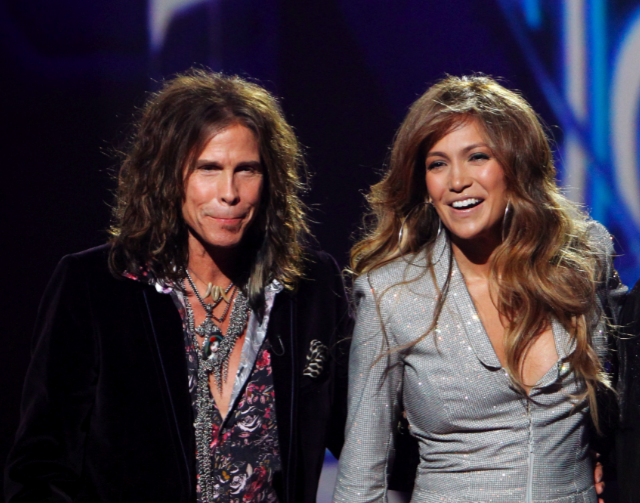 Steven Tyler is thrilled to be joining Jennifer Lopez on 'American Idol' because he is "in love" with her. The Aerosmith frontman and the singer-and-actress have joined Randy Jackson on the judging panel of the pop star search show and Tyler admits it is a dream come true to work with Lopez because he has been infatuated with her since watching her last movie. He said: "I watched 'The Back-up Plan' and I fell so in love with Jennifer because I watched her eyes and how she interacted with the actor and they really put it across that they were falling in love. I thought that I would maybe someday soon be looking into her eyes - although not quite like that. But as most things go in my life, watch out what you dream for and they may come true, and here I am sitting next to her and it's just phenomenal." It seems the professional adoration is mutual as J.Lo - who is married to singer Marc Anthony - has revealed she was "moved" by the rocker the first time she met him. She said: "I know he's an amazing rock God, I get that. I know that. But to sit and speak with him, the depth of his soul really moved me." Although Tyler is full of praise for J.Lo he insists he won't be afraid to tell the contestants what they are doing wrong and is prepared to crush the ambitions of anybody whose singing is not up to scratch. Speaking to 'American Idol' host Ryan Seacrest during a joint interview with J.Lo and Randy, the 62-year-old musician said: "I can say, 'You're going to Hollywood,' but also you gotta tell them, 'Don't hate me for what I say, don't get mad, get better.' I will send them home with a broken heart. I'm going to be honest and truthful and open as best I can - and tongue and cheek." Tyler and J.Lo have joined the panel following the departures of Simon Cowell, Ellen DeGeneres and Kara DioGuardi. The 10th series of 'American Idol' premieres on January 12 2011.